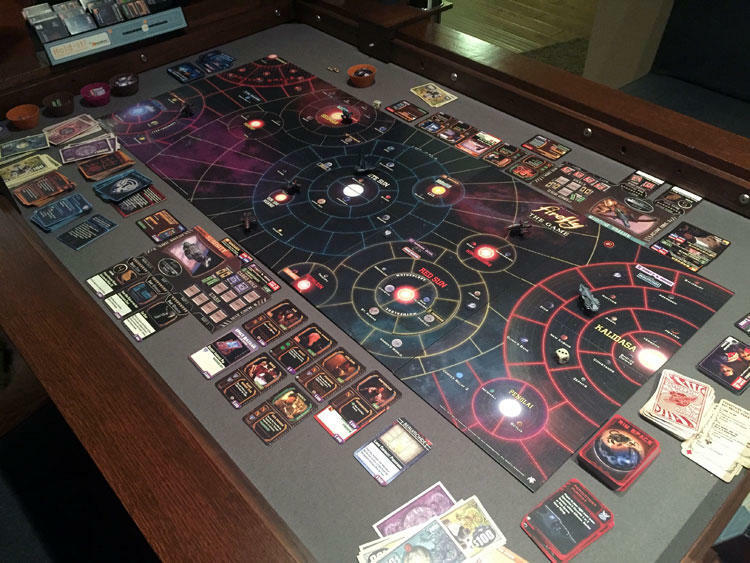 We review the new Kalidasa expansion for the Firefly board game. This new expansion adds a new section of space for the players to explore and also gives some new variety to the jobs and gear cards. 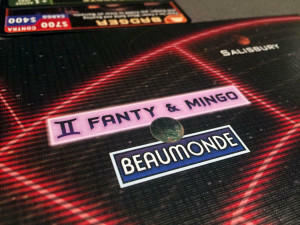 Since we first reviewed the fantastic space exploration game Firefly (review here), publisher Gale Force 9 has released a number of expansions to the game. From smaller expansions like Breakin’ Atmo and Pirates and Bounty Hunters, to the big box ones like Blue Sun, there has been no shortage of content for those that enjoy spending time in the ‘verse. Today we are going to look at the newest and (possibly?) 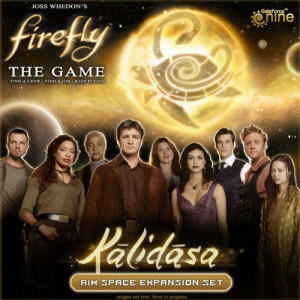 final expansion to the Firefly Board Game, Kalidasa. This second big box expansion takes players to the other side of the ‘Verse, adding in more “rim space” for the players to explore. The Kalidasa adds a number of new components to your Firefly game and we’ll check these out in turn. The main draw of Kalidasa is the game board extension. Kalidasa adds a new 10” x 20” board that sits on the right side of the base game map. This new board adds a number of systems and planets for the players to visit. One of which has both a new contact location and also a new place to spend your hard earned cash. The new shop and contact are way in the upper corner of the board. As expected, players will not only find new cards for the contacts from the base game, but also two new contacts. Magistrate Higgins, resident of Canton (found on one of the moons of Harvest), and Fanty and Mingo, twins based out of Beaumonde. Each has their own type of jobs they can offer players. 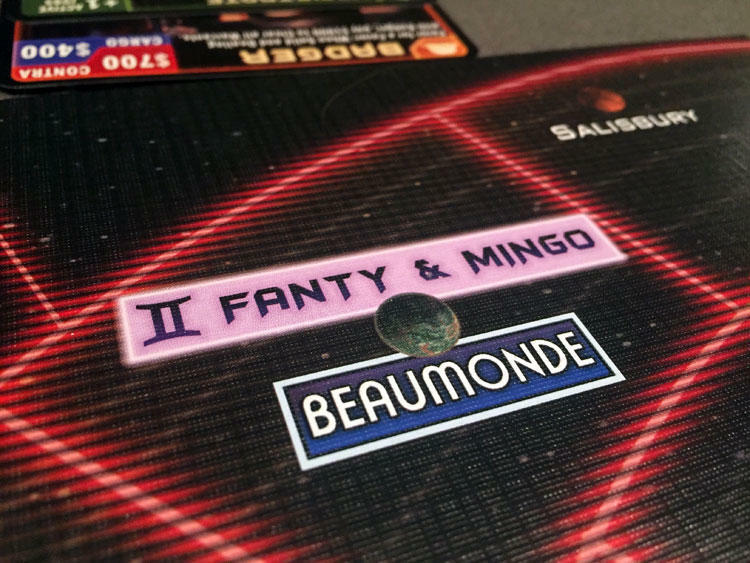 Speaking of Beaumonde, players can stop at this planet to do some shopping for various supply and gear. 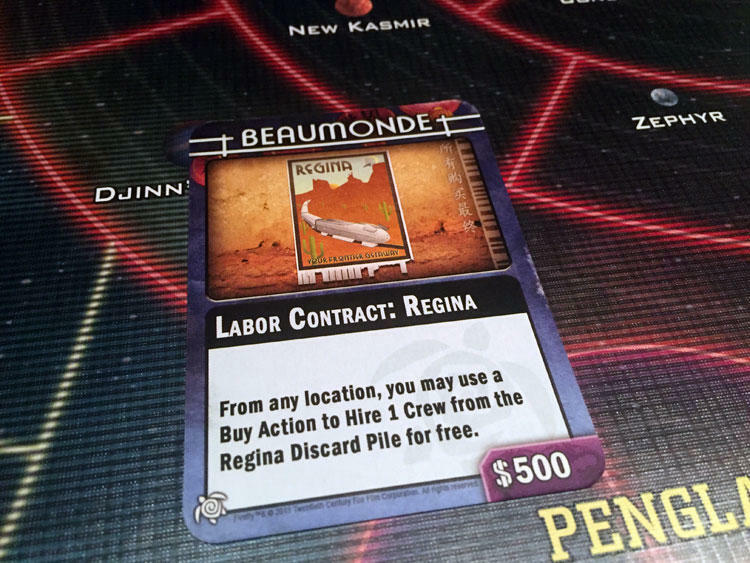 One of the neat new offerings from this planet is the contract cards. These let players buy cards from planets other than the ones they are currently at. For example, the Labor Contract: Regina card will let the player hire crew from the Regina discard pile from any planet. Kalidasa also comes with 71 nav cards to be intermixed in the various nav decks. To go along with this, there is a new ship miniature, the Alliance Corvette. You might remember this ship from the movie Serenity. This was the home base of the Alliance Operative that spent much of the movie searching for River Tam. 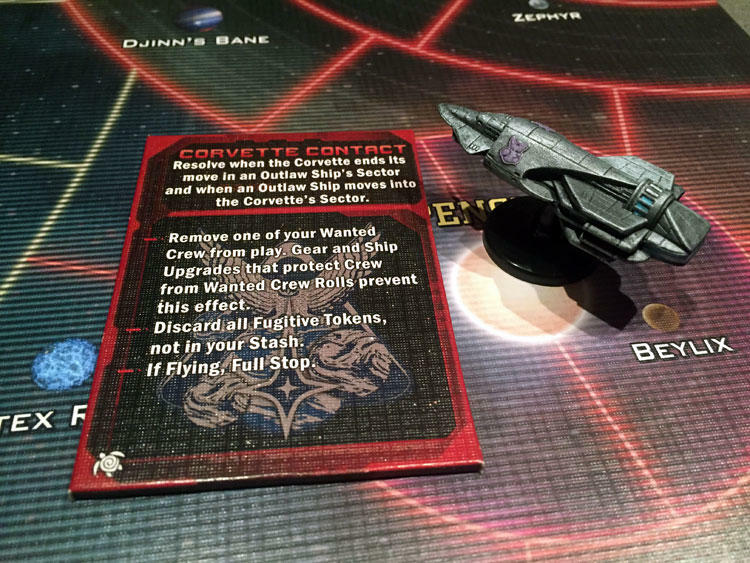 Unlike the Alliance Cruiser from the base game, the Corvette can travel anywhere on the board and will make like miserable for players with fugitives in their crew. 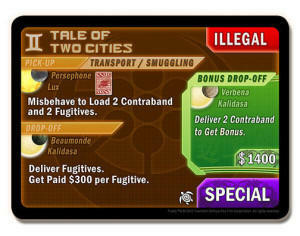 Finally, Kalidasa comes with some new game missions and a new leader. The missions add in a nice bit of variety to help change things up from the ones in the base game. The new leader is a notorious slaver and con man who will fit in well with crews of flexible morality. The Corvette (I painted mine) can enter any type of space to pursue its targets. The Kalidasa expansion does a great job of adding a variety of content to the base game without upping the complexity at all; which is exactly how I like my expansions. I don’t want to have to learn a whole new game when I add content. Some of the new job cards will have ways to earn bonus money, and also dual keywords. I found that the new jobs in Kalidasa add in a good deal of variety. First, there are the new Bonus Drop-Off options. These give the players the option of making a second stop on their way to completing their job to earn some bonus cash. This has a risk vs reward feel to it, especially when working an illegal job. 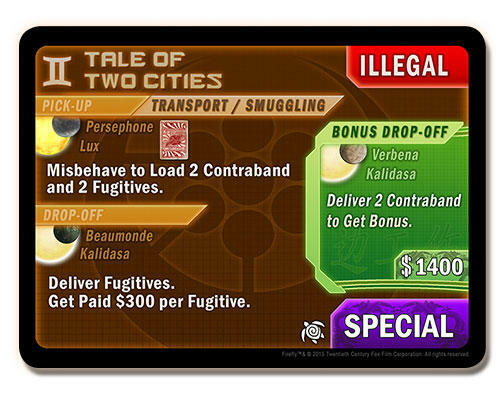 If you are carting around a ship full of contraband, you might need to think twice before making a detour. The second thing you’ll find are dual keyword jobs. Some jobs might be considered both shipping and smuggling jobs. This can come into effect if you gain bonuses for completing certain job types. One clever new addition to the game is the new “nested tests”. 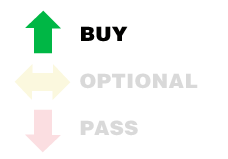 These work a little like if/then statements. For example, you might have to pass a speech test, but if you roll under a 5, then you then have to make a weapons test. I liked this addition as it helped add a bit more tension to the game. The new contacts each add their own spin on the game. Magistrate Higgins has mostly transport jobs, but creatively, you can’t work with him if you have Jayne in your crew. Along with him come many mudder crew cards that can be dropped off in Higgin’s mud pits as indentured servants to earn some quick cash (and possibly the ire of your moral crew). The new labor contracts will let you buy from planets you are not currently at. Fanty and Mingo’s jobs are all illegal, some immoral. While they are high paying, they are also located way in the corner of the board, with not much else interesting around them. Speaking of the board, the addition of Rim Space is great and adds more variety to your travels. However, if you already have the Blue Sun expansion, this won’t be very new to you. In fact, adding in both of these expansions is going to make life a bit rough unless you have a rather large gaming table. This game has turned into an absolute table hog. After playing both the Blue Sun expansion and now Kalidasa, I think only the most diehard of firefly fans need both. While the each expansion has their own things that make them great, there is some overlap between the two and the added table requirements can make playing with both difficult. Also, trying to fly your ship from one end of the board to the other can take many turns. Adding in every Firefly expansion is going to put a huge demand on your table real estate. The Kalidasa expansion is another solid offering by Gale Force 9 that helps round out the full ‘Verse. I’m hoping this is the last expansion for Firefly, mostly because I’m fully out of table room. In my opinion, Kalidasa makes some great additions to the Firefly game. I enjoyed the Alliance Corvette and the troubles he causes, while the new job mechanics help to keep things fresh. If you already own Blue Sun, than this is definitely an optional buy (more so if you don’t have a large table). If you don’t own Blue Sun, then I think it’s worth getting either Kalidasa or Blue Sun. I’d say get Blue Sun if you want more chaos from having 3 Reaver ships in your game, or get Kalidasa if you’d rather tangle with the Alliance Operative who can move anywhere (and quickly). Or if you are like me and have to have everything Firefly, get both! Overall though, I enjoyed Kalidasa and feel like my Firefly game is now complete. If you’d like to pick up a copy of the Kalidasa expansion, you can get it for about $33. Am a bit late jumping on the Firefly games bandwagon and am barely purchasing the base game now. But as a completist and budding Browncoat, albeit one on a budget, I’m a bit overwhelmed so I come to seek advice: besides the base game, which expansions are must-haves (I’m also counting all the booster packs like Breakin’ Atmo and the newest Crime and Punishment)? I aim to play this mostly solo because, sadly, I have no gaming group, so that might narrow down my options? Blue Sun and Kalidasa: these are the 2 big box expansions. They each add a new section of map space. Blue Sun focuses more on the reavers, while Kalidasa focuses more on the alliance. Breakin Atmo: Just ads more cards to stores and contacts. Of all those, I’d probably say to get Breakin Atmo, because it’s cheep and adds some variety. After that, I’d pick one of the big boxes to get. Either Blue Sun if you want more Reaver fun, and Kalidasa if you want to deal more with the alliance. Since you are solo you can probably skip Pirates and Bounty Hunters.